We believe it is our responsibility to source the best possible options when creating and preparing a menu. 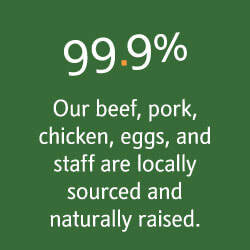 That includes having close relationships with partners who provide sustainable seafood and seasonable, local produce. When in doubt, carry it out! Call ahead, pick it up. We deliver to your car! Just take a photo and feed someone in need. Brunch is served 10 am - 2 pm, dinner starts at 4:30 pm.